Collected as a kid over 65 years ago… pack by pack, card by card, stored in a closet, and just recently discovered again. Sound familiar? That’s the story behind this collection that we just purchased from a long time collector based out of New Jersey. They were well loved. They were shown to friends. They were traded. They were flipped. They were thrown against the wall. They were tacked to the wall. They were taped to the inside of a book. They were his favorite players of the time. These cards WERE his childhood. But now? Just sitting in a closet collecting dust, with no one to pass them down to. Realizing that they probably have some value, he decided to finally part ways with the collection - and that's where Just Collect comes into the picture. Last week, we were able to purchase this collection, and this week, we're excited to show you this "fresh" collection that has finally surfaced after 60+ years. The condition of the cards was nothing to brag about, being “collector grade”, but since it was filled with so many stars, the value really started to add up. The overall condition ranged from Poor to EX, with a few examples being nice enough to send off to PSA for grading! The rest of the cards we have listed individually on our ungraded eBay account, and they have already garnered a tremendous amount of interest! 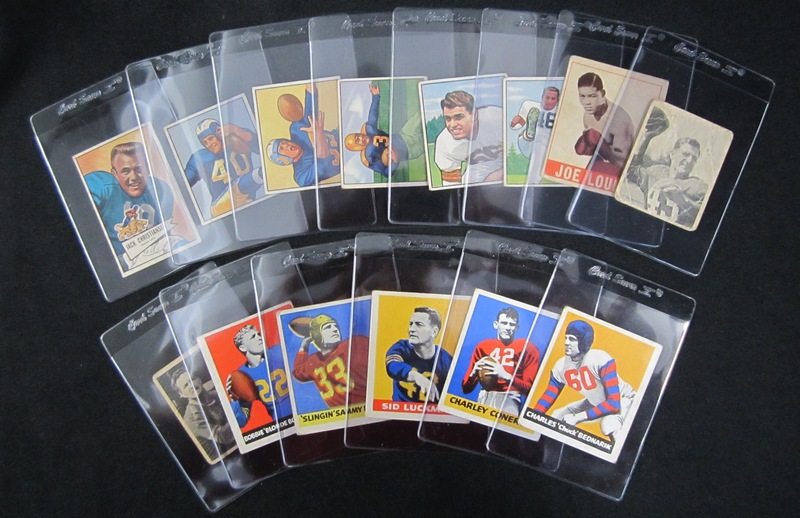 The nicest groups of cards, based on condition, were the 1950 Bowman football cards. They were mostly well-centered and only exhibited some minor corner and surface wear. Their condition, paired with their aesthetic beauty (have you seen a better looking set?! ), makes this group extremely desirable, and we are excited to see how these will grade out. The most valuable cards in the collection were the 1948 Leafs. They weren't a sharp as the 1950 Bowman's, but all the major stars were present: Sid Luckman, Bulldog Turner, Doak Walker, Bobby Layne, George McAfee, Bob Waterfield, Sammy Baugh, Bill Dudley, George Connor, Chuck Bednarik and Charlie Connerly. The two best from that group are the Chuck Bednarik and Sid Luckman. The Bednarik is ultra-rare, as less than 150 total examples have been encapsulated by PSA, with only 1 example being NM/MT or better. There were some other individual cards that also packed a punch, like the Joe Louis card from from 1948 Leaf Boxing. Regardless of condition, this card is a heavyweight among hobby enthusiasts. Two other cards that really stood out were the 1948 Bowman Sid Luckman and Sammy Baugh rookies, both of which are Hall of Famers. It was another great find for Just Collect. Do you have a vintage football card collection for sale? Give us a call today to see what it's worth!